To correct my error from last time, I have added a reminder on my phone to tell me to post every Friday. That should work. Friday is usually when I'm winding down from the furious pace of the work week, and so I become more interested in satiation than delivering quality entertainment. Not this time, though. Because talk about stress, huh? My toilet has been acting up. Last Saturday it started making a loud hissing noise. Monday I sent a work order to my building, asking if they could, you know, fix it, or tell me if I needed to call a plumber. By Wednesday, I'd heard nothing, so I followed up. I was told the janitor would review the problem. So it's now Friday. Still a loud noise. Louder, actually. It turned out the toilet was leaking water into the downstairs apartment. Shudder. So today the janitor re-seated the toilet and replaced the sealings that had gone bad. The hissing is still there, though, and I was instructed by the building to "be careful" when I used the toilet. It's like living with an unexploded shell. Back in May of this year, I'd left the apartment for 20 minutes and came back to find dozens of gallons of water on the floor. The toilet had overflowed. I don't want that to happen again; I went into a fugue state trying to clean up all that water. It's worrisome to think that something like that will happen again. Aah, it's out of my control. Anyway, while posting today, I noticed that, while the clouds in the last panel of this week's page foretold doom and dire consequences, they are a giant switch from the blue, cloudless skies in the panel immediately preceding it. The reader can't tell if it's the same day or even the same location, or anywhere near where the rest of the page was happening. Serves me right. Having dark, foreboding clouds to instill a sense of foreboding in the reader is played out. It's an old trick, and it is running out of people who have never seen that before. I will have to think of another way. Maybe I should just replace the clouds with the same sky color as before, and count on the twisted angle and sharp corners of the building to instill the foreboding. Did you know you can order a copy of this comic? You can! And that way, if I happen to miss a post on Friday then you won't miss a thing because you'll have the whole book already! Published on October 28, 2016 by Sam Battin. "I'm sorry, Crimebuster", says the Police Sergeant on the scene. "I've just received orders from the D. A. in charge of prosecution." Crimebuster is about to reply, but seeing the Sergeant's serious expression, closes his mouth. 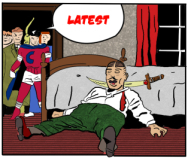 The Sergeant continues with his strange news: "The D.A. told me not to cooperate with your investigation. Our department can't share information or resources with you." The sergeant pauses, and then adds "You're on your own, Crimebuster." We see a courthouse building made of steel and concrete and glass. Dark, foreboding clouds appar in the sky above it. A caption reads "Away from the mean streets of Durham, we now shift our attention to goings-on within the corridors of power."